GeloMyrtol® 300 mg has clinically proven efficacy and safety in trials with over 6000 patients it reduces the need for antibiotics. 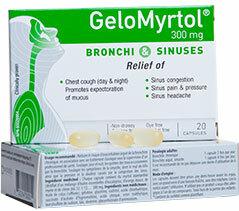 Over 23 countries in the world use Gelomyrtol to relieve the symptoms of sinusitis and bronchitis. Millions of Europeans use it to relieve themselves from their symptoms of common cold as soon as they appear, for common cold often are the origin of respiratory infection such as sinusitis and bronchitis. For symptoms treatment of bronchitis and sinusitis (acute and chronic). Many long-time users take GeloMyrtol a the first signs of common cold to avoid complications into a bronchitis or sinusitis. (Chronic) Bronchitis: Take 1 capsule 3 times a day. (Acute) Bronchitis, sinusitis: Take 1 capsule 4 times per day. It is recommended that you consult your physician before exceeding a 6 months duration of use. Capsules of GeloMyrtol® 300 mg should be taken half an hour before mealtimes with an ample amount of cold liquids without chewing. Never with hot drinks. may not be used if there is a hypersensitivity to any of the ingredients of the product. Capsules of GeloMyrtol® 300 mg can be taken in conjunction with other medication, for example antibiotics. Consult a health care practitioner prior to use if you are pregnant or breastfeeding. GeloMyrtol is a mucolytic, firmly anchored mucous in your sinus and bronchi starts to flow because the viscosity of the mucous is reduced. GeloMyrtol is a secretolytic, liquefies the mucous by increasing the secretions of the glands. GeloMyrtol is a secretomotoric, Activates the movement of the cilia, improving the evacuation of the mucous. The first effects are felt within the first hours, the majority of patients are symptom free at 3 days of others at 6 days. Act on upper and lower airways. Reduces the viscosity of the mucous. Liquefies the mucous and promotes it's evacuation.
" I have a severe case of COPD, I have added GeloMyrtol to my regular medication, Now not only I do not have any coughing fits that were irritating my bronchi, I have stop coughing completely, GeloMyrtol changed my everyday life. [...] "
" I have tried GeloMyrtol and now no more line ups at the urgent care to see a physician. I start taking GeloMyrtol at the first sign of sinus congestion [...] "
" I use GeloMyrtol like the Germans do, to treat my sinuistis… AND IT WORKS! I feel that the mucus liquifies itself and I breath again… [...] "
" GeloMyrtol works good for me and no changes on my glucose levels! I recommand it to all [...] "
Where to get it ? GeloMyrtol is distributed in Canada by Nadurel Pharma. For more information or opportunities visit us at : www.nadurelpharma.ca. 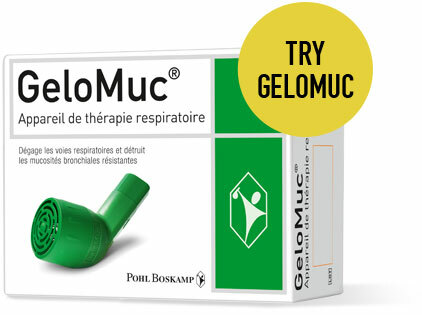 GeloMuc® is Vibratory positive expiratory pressure (PEP) breathing treatment device for shifting persistent, tough bronchial mucous from the respiratory tract, for example in patients with chronic bronchitis, chronic obstructive pulmonary disease (COPD) or asthma.